Sample all of our famous GO Isotonic Energy Gel Flavors in this Mixed Gel Bundle. Used by the likes of USA Cycling, USA Triathlon and Rock ‘n’ Roll Marathon runners, find out which one is your favorite. Flavors include: GO Isotonic Orange, Tropical, Cherry, Chocolate, Apple, Lemon Lime; GO Energy + Caffeine Berry, Citrus, Double Espresso; GO Energy + Electrolyte Raspberry, Lemon Mint. 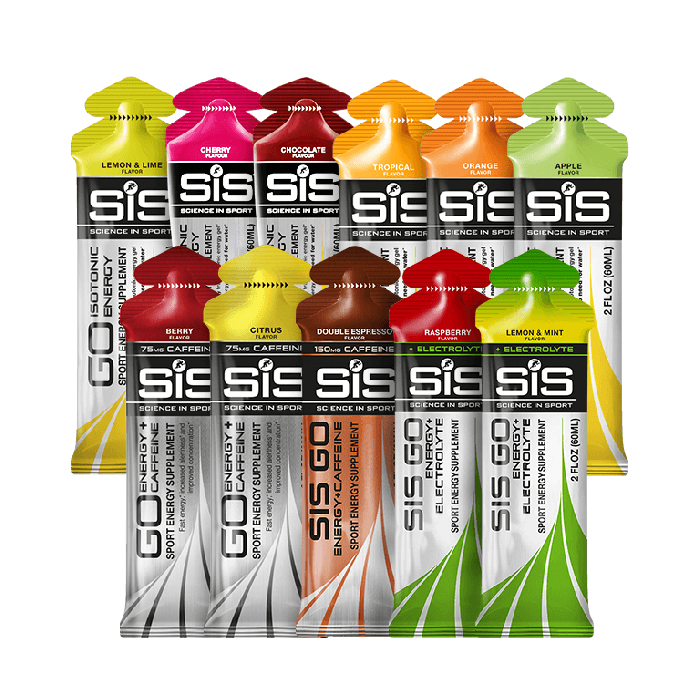 About SiS GO Isotonic Energy Gels The SiS GO Isotonic Energy Gel was the world's first isotonic gel effectively delivering an easily digestible and quick supply of carbohydrates for energy during exercise. They are designed to be consumed without water, minimizing the risk of being bloated that can sometimes occur with over-drinking. Provides you with 22 grams of carbohydrates per gel. 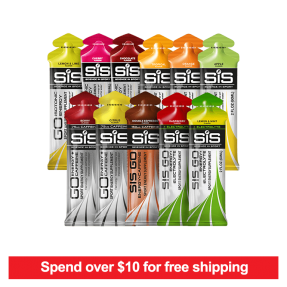 Benefits of SiS GO Isotonic Energy Gels Depleting your carbohydrate stores during exercise is one of the major causes of fatigue. Delivering additional carbohydrates during exercise is known to improve performance, race times and delay the onset of fatigue. The Isotonic formula allows the gel to empty from the stomach quickly as no fluid needs to be drawn into your stomach to dilute the gel, providing fast energy. SiS GO Isotonic Energy Gels are highly practical and can easily be carried without the requirement for bulky bottles. Awards Winner of the Queens award for enterprise, this innovative product continues to be seen at the forefront by endurance athletes. Use during endurance sessions and events to help avoid crashing. Key Features Truly isotonic formulation - no need for water 22 grams of rapidly absorbed carbohydrates per gel Convenient easy-to-take format Contents: 11 x 60ml gels per pack Flavored Maltodextrin gel with added sweetener. Suitable For Vegans. Best By Date: Refer to individual date on packaging. Aim for 1 x SIS GO Isotonic Energy Gel and 2 x SiS GO Isotonic Energy Gels per hour during exercise lasting over 90 minutes. 1 x SiS GO Energy + Electrolyte Gel can also be consumed before exercise to ensure electrolytes are available for fluid absorption. The gels do not taste salty and are available in refreshing raspberry and lemon & mint flavors. The SiS GO Energy + Electrolyte Gel is not isotonic as the additional of electrolytes increases the concentration. SiS GO Energy + Electrolyte Gel contains natural flavorings.